ATLANTA – The Carolina Panthers proved it’s not how you start (1-3) but rather how you finish (11-1). The Panthers (12-4) fell behind the Atlanta Falcons 10-0 early in Sunday’s game, but ended up winning 21-20. The win gave the Panthers the NFC South Division championship, earned them a bye in the playoffs, and at least the NFC number two seed. Should Seattle lose and San Francisco win, the Cats would be the top seed in the NFC. But let’s not worry about that. Just savor the NFC South title for two weeks…at least! This team now joins the 1996, 2003 and 2008 teams as division winners and earned the Panthers at least one home playoff game. Panthers quarterback said this team had been “0-for since he got here” on Fox TV after the game. But today, he can call himself champ! The defense made life miserable for Falcons quarterback Matt Ryan, as the Panthers recorded a team-record nine sacks of Ryan, including four by Greg Hardy alone. Hardy broke Charles Johnson’s single-game record of 3.5 sacks, set here last season, and tied Kevin Greene (15 in 1996) for the most prolific sack season in team history. The Panthers finished with 60 sacks on the year, which tied the ’96 team for most in a season. One thing Atlanta did that no other team accomplished against the Panthers this season was to score a touchdown on its opening drive. It was an 11-play, 80-yard drive capped by a 9 yard touchdown pass from Ryan to Matt Snelling. The Falcons added a 42-yard field goal by Matt Bryant to go ahead by 10 with 10 minutes remaining in the half. Then the Panthers got going. White’s pick-six was followed by a 13-play 96-yard drive culminating with Newton throwing a 3-yard touchdown pass to Ted Ginn with just 19 seconds remaining in the half. Atlanta responded with a 39-yard touchdown pass from Ryan to Roddy White with 9:50 remaining in the third quarter to take a 17-14 lead. But Newton was not done. He led the Panthers on a 10-play 76-yard drive that ended with a 7-yard touchdown pass to tight end Greg Olsen, putting the Cats back on top, 21-17. In the fourth quarter, Atlanta added a 37-yard field goal by Bryant to get within a point of the Panthers at 21-20, but could do no more. On their final drive of the day, the Falcons were trying to get close enough to kick a potential game-winning field goal, and were driving down the field when disaster hit. A bad snap from center to quarterback led to a big loss and with the clock running down, Ryan tried to spike the ball, but the offense was called for illegal procedure, and, with a mandatory ten-second runoff on the clock that effectively ended their chances. Offensively, Newton, playing on an ankle he twisted last week against New Orleans, was the game’s leading rusher with 12 carries for 72 yards and also threw for a pair of scores. He ended up 15-of-27 passing for 149 yards, two touchdowns and one interception (off a tip). Olsen caught 6 passes for 42 yards and one touchdowns. 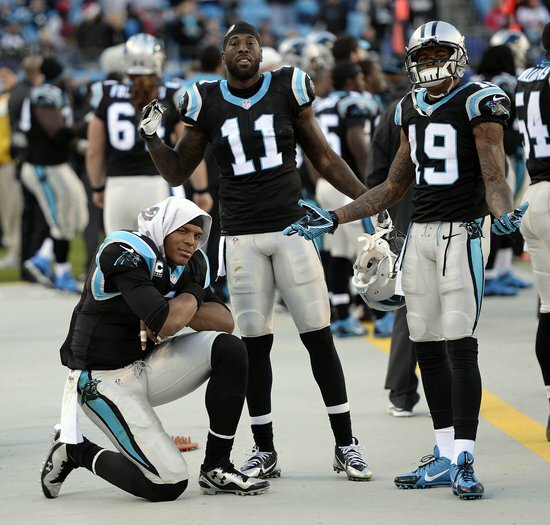 Newton’s favorite receiver, Steve Smith, was not available for the game due to PCL (knee) injury. The bye next week gives him a good chance to recover and possibly play in the playoff game in Charlotte. Trailing 10-0, perhaps the game’s biggest play was made by an unknown. Rookie cornerback Melvin White intercepted Matt Ryan and ran the ball into the end zone for a pick-six, bringing the Panthers back into the game. The interception was officially recorded as an 8-yard touchdown, but it completely changed the momentum of the game. The Panthers went on to score another touchdown to lead 14-10 at the half. 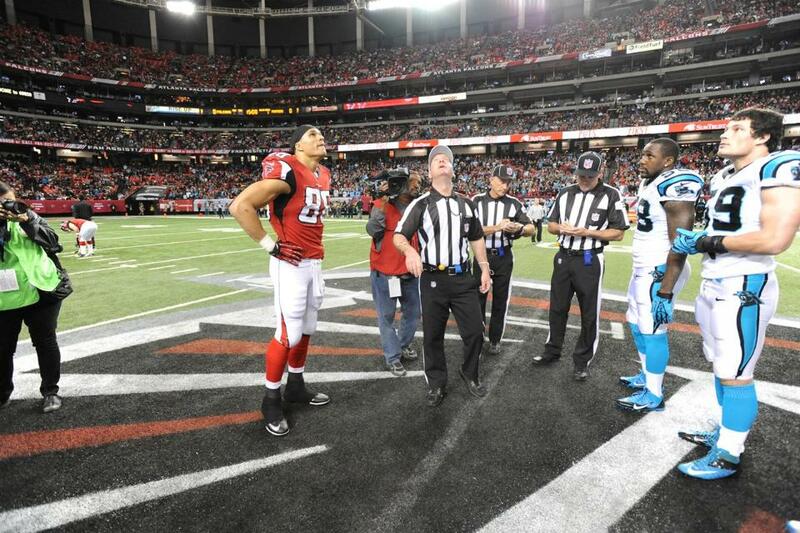 Atlanta’s future Hall of Fame tight end, Tony Gonzalez, was honored before the game, as he was the lone player to represent the Falcons at the coin toss. He also was honored at halftime by team owner, Arthur Blank. The fans gave Gonzalez tremendous applause during the game. And, incidentally, Gonzales caught Ryan’s first and last pass of the game. After gaining the bye into the playoffs, the Panthers will host a yet-to-be-named opponent in two weeks at Bank of America Stadium in Charlotte. It’ll be fun! Surprises always are…and if any of you thought this team, either as the season began, or as they started 1-3, would be hosting a playoff game…let me know. Personally, I had them down for 10 wins this season…but then again, I had them down for 9 last year and was way off. Much happier to be one short this season! The Carolina Panthers incredible year now adds another chapter. A huge home game played in two kinds of weather…first in nice weather, then in a deluge. And Cam Newton finally showed everyone why he was the number one draft selection three years ago, leading his team on a 65-yard, no-timeout touchdown drive in the last-minute of the game. 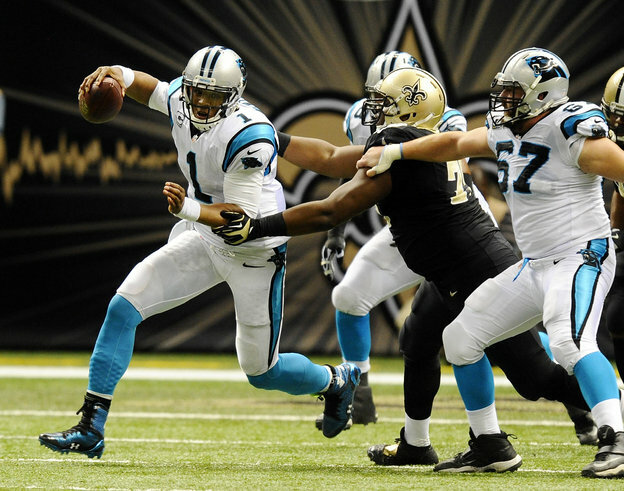 Final: Carolina Panthers 17, New Orleans Saints 13. Carolina is back in the playoffs for the first time in five years. The Panthers (11-4) can claim the NFC South, a first-round bye and at least one home playoff game by beating the Falcons (4-10) next weekend in Atlanta. A loss by the Saints (10-5) against Tampa Bay (4-11) next week also would give the Panthers the division. The Panthers won on a day when they were outgained by 143 yards, ran nearly half as many offensive plays (44) as the Saints (81) and were 0-for-9 on third downs. In the biggest home game of the season…heck, the biggest GAME of the season…the Panthers made everyone uncomfortable. Well, not really, but for fans, they waited nearly 60 minutes to absolutely explode…The Panthers winning drive began with 55 seconds left…no timeouts remaining…on their own 35 yard line. Newton finally found the touch he was missing all game, and made the biggest play of the drive (and maybe of the season) when he found Ted Ginn Jr. on a deep in route for a 37-yard gain to the Saints’ 28. Coach Ron Rivera thought Ginn would be open if the line protected Newton, which it did. A completion to tight end Greg Olsen moved the Panthers to the 14, setting up the winning play by Domenik Hixon, who was only in the game because Steve Smith had injured his knee in the first half. With Saints safety Malcolm Jenkins blitzing, Hixon beat cornerback Corey White on a corner route and Newton found him. Hixon, who came to Charlotte from the Giants during the offseason, had caught three passes for 21 yards before Sunday. Who else was uncomfortable? Every one of the 24 players tackled by linebacker Luke Kuechly. That’s right, 24 tackles by Keek, the most in a game since 1994, according to STATS, LLC. And he also had an interception…just so you know he’s a really good player. Probably the most instinctive linebacker in the league. And add to that linebacker Thomas Davis, who had another monster day. And, just in case you were concerned that the special teams get no credit, second-year punter Brad Nortman punted eight times with an average of 50.8 yards and a net of 47. He hit a long of 60 and downed two punts inside the 20. Not only did those two go inside the 20, they went inside the 5. His third-quarter punt was downed by Josh Thomas at the 2, and his early fourth-quarter punt from the Carolina 40 went 57 yards to the New Orleans 3.There can’t be many games in the NFL where the winning team gets zero third-down conversions and trailed in time of possession by more than 17 minutes. But win they did, reversing the results they received two weeks ago in New Orleans. They did it by pressuring the Saints all day long. 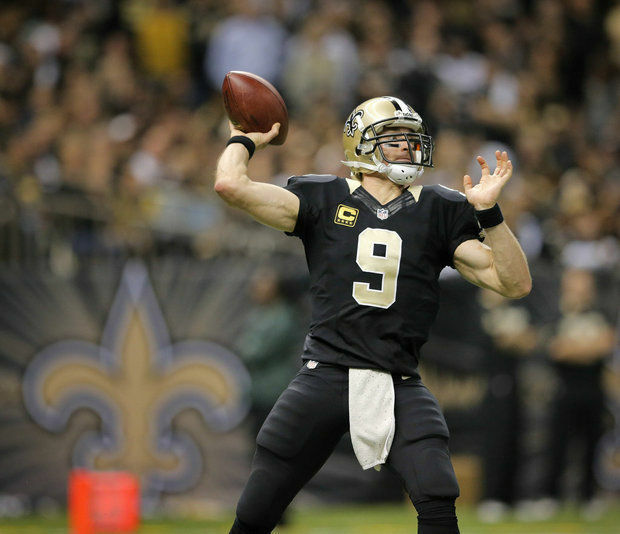 The defense pressured Saints quarterback Drew Brees, unlike two weeks ago, and it paid off. Offensively, Newton made enough plays to get the points necessary for the win. This despite a bad ankle and the loss of wide receiver Steve Smith, his favorite target, early in the game (knee) and despite playing on a waterlogged field that received over an inch of rain in the third quarter. They won because it was their time. The pieces are in place. Now they need to finish the regular-season off with a win, earn their first-round bye and get to host a home playoff game. Anything beyond that is an absolute bonus! 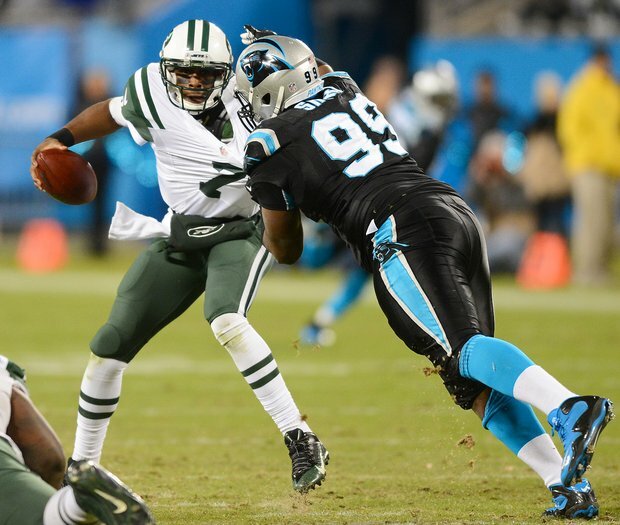 Entering the fourth quarter, the Carolina Panthers knew they needed to make plays against the New York Jets (6-8). And this time it was a special-teamer – little-known Jason Williams – who blocked a punt early in the fourth quarter with Carolina clinging to a 16-13 lead and led to a Panthers touchdown. And everything turned around…just like that. Seven minutes later, Panthers cornerback Captain Munnerlyn intercepted a pass and returned it 41 yards for a touchdown, giving the Cats an insurmountable 30-13 lead. That play gave Munnerlyn his fifth career pick-six setting a team record . He previously shared the record with Mike Minter. Munnerlyn has seven career interceptions, so returning five for touchdowns is a remarkable feat. The Jets did score once again, but could not come any closer. Final score, Panthers 30 Jets 20. New York played tough on Sunday…like a team with nothing to lose. And that’s how they should be playing. See what talent you have and let ’em go after it. Carolina, on the other hand, now owns a 10-4 record, are in the 5th playoff slot, but, with a win next Sunday against the New Orleans Saints (also 10-4) and a win the following Sunday at Atlanta, the Panthers would win the NFC South and get a bye going into the playoffs. 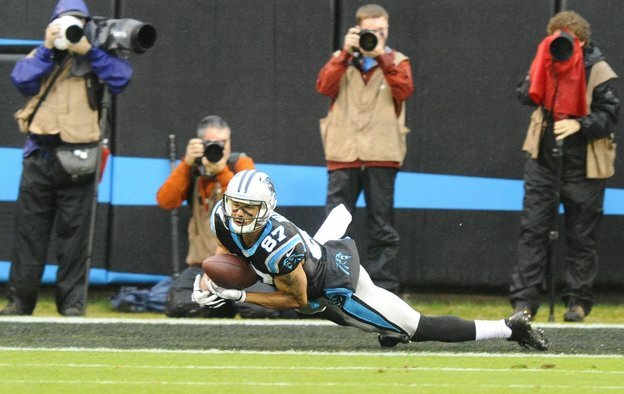 While the Panthers win wasn’t pretty – I would call it workmanlike – it was critical. The NFL’s No.1 scoring defense gave up 20 points to the very average Jets (6-8). The Panthers had to kick three field goals when drives bogged down, and “Riverboat” Ron finally misfired, going for a fourth-and-2 and missing it. But style points mean nothing in the NFL these days. Only wins do. And the Panthers now have 10 of them, including nine out of their last ten games. Big plays…the blocked punt, the returned interception, a 72-yard touchdown reception by DeAngelo Williams…this has become the hallmark of the 2013 Panthers team. Making big plays when they need to and taking care of business for the rest of the game. Like last week, the Panthers began slowly, getting only two field goals in two red zone opportunities early. They left eight potential points out there. And they are aware of this problem. In all, the Panthers went a dismal 1-for-5 inside the Jets’ 20 – a stat that usually doesn’t equal victory. Panthers quarterback Cam Newton put a slight scare into the crowd, going into the locker room with one play left in the first half. Scrambling on third down late in the first half, Newton was tackled by New York defensive lineman Muhammad Wilkerson, who slammed him down on his left hip and landed on his lower body. Newton waited until the last-minute to emerge from the tunnel and jog back to the Carolina Panthers’ sideline to start the second half. Head trainer Ryan Vermillion brought two extra pairs of cleats for Newton and placed them at the end of the bench while Newton warmed up. It can be very simple: If the Panthers win out, Carolina will win the NFC South and receive a first-round bye. Or not. the 49ers, Panthers and Saints all sit at 10-4, but San Francisco lost to both New Orleans and Carolina this year. Arizona (9-5) is also in the mix for a wild card and would hold the tiebreaker with the Panthers if both teams finish with the same record. The next two weeks will be stressful for players, coaches, management, owners…and fans. But wildly entertaining if you just love football. NEW ORLEANS – Advantage, New Orleans. Yes, the Carolina Panthers will get their shot at redemption on Dec. 22 in Charlotte, but for now, the Saints are one game up on the Cats in the NFC South race. After getting off to a 6-0 lead, the Panthers could do nothing right. 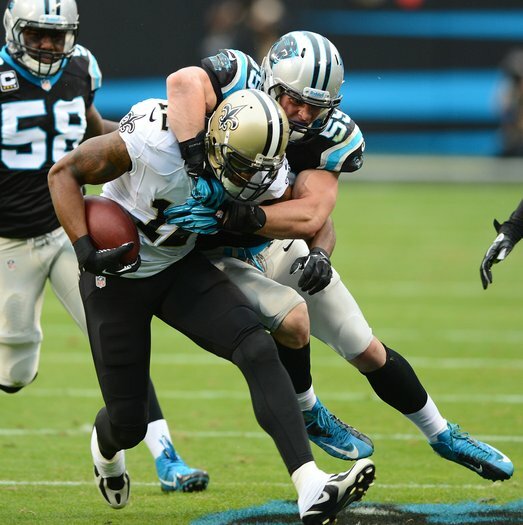 They were ripped apart by Saints quarterback Drew Brees. The Panthers defensive backfield was exposed and Saints defensive coach Rob Ryan attacked the Panthers offensive in so many ways the visitors were unable to mount any kind of attack. Panthers center Ryan Kalil said offensively, not being able to convert their two red zone opportunities into touchdowns made the Cats one-dimensional when they fell behind. That limited the way the Panthers could play…something they had not experienced in nine weeks. On the other side of the ball, Brees bounced back from a rough outing last week to carve up the Carolina Panthers’ secondary Sunday, passing for 313 yards and four touchdowns in the Saints’ 31-13 win before a raucous crowd of 73,000-plus at the Superdome. The loss snapped a franchise-record, eight-game win streak for the Panthers (9-4), who dropped a game behind New Orleans (10-3) in the race for first place in the NFC South. The Panthers’ last loss had been a 22-6 defeat at Arizona on Oct. 6. Carolina fell a game short of matching Kansas City’s nine-game streak for the longest this season. But the Panthers allowed Brees to get in a rhythm, failing to get any pressure on him during a second quarter when Brees threw three touchdowns to take control of the game. That’s when the game was really decided. 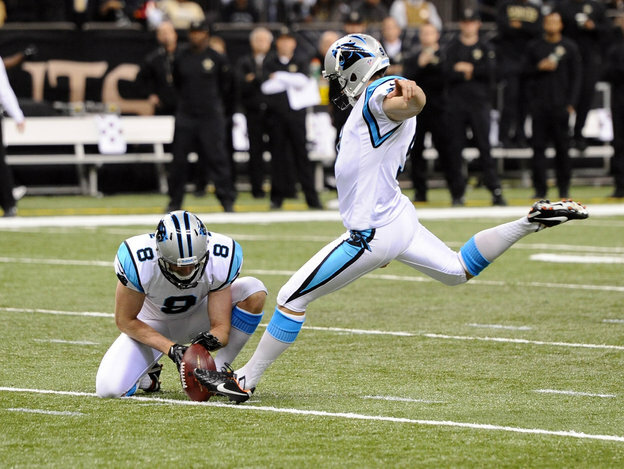 The Saints scored touchdowns on consecutive drives of 80, 86 and 76 yards and the Panthers did nothing. Brees completed 30 of 42 passes and became the fifth quarterback to surpass 50,000 career passing yards, joining Brett Favre, Dan Marino, John Elway and Peyton Manning. The 31 points were the most allowed by the Panthers’ second-ranked defense since a 44-38 win at New Orleans in Week 17 last season. But that game came against a Saints’ defense that gave up more yards than any team in NFL history. 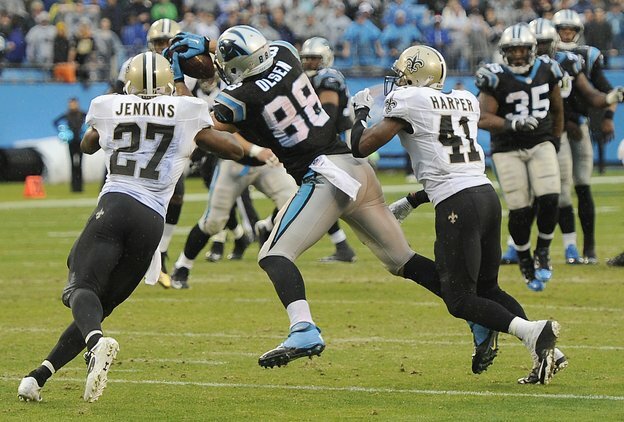 Rivera said the defensive backs allowed the Saints’ receivers too many clean releases off the line of scrimmage. Marques Colston caught nine passes for 125 yards and two touchdowns, while tight end Jimmy Graham added six catches for 58 yards and two scores. Carolina had no plays of 20 yards or more, compared to six for the Saints. New Orleans improved to 7-0 at home, and is 8-1 in ‘Sunday Night Football’ games. So…what really happened? Personally, I was not surprised the Saints won. I was surprised at the lack of fight the Panthers put up offensively. Brees is going to attack any defense…you know that. But Sunday night, in front of a national television audience, the Panthers weaknesses were totally exposed. Brandon LaFell dropped a first-down pass when Carolina was still in the game. Cam Newton started well but lost his way, repeatedly holding the ball and allowing the New Orleans rush to take him down. Defensively, the front four for Carolina was inept. Were the Saints linemen holding a bit? It happens. But this unit plus the linebackers, is proud. They are the ones who put pressure on the other guys. Not Sunday night. Brees had time to find open receivers all night…and yes, they were open all night. Brees threw 41 passes before he was sacked. That’s because the Cats began to blitz in the third quarter. Why they didn’t do that in the first half is a mystery. The lesson here – do not give Drew Brees time to throw. Especially if your defensive backfield, the so-called “Legion of Whom,” is what it is. The Panthers made mistakes, committed poorly timed penalties and came undone. The Panthers racked up four defensive penalties in the second quarter, three of which were credited to the secondary – holding on cornerback Captain Munnerlyn, pass interference on cornerback Drayton Florence and pass interference on safety Mike Mitchell. That’s one way to give up 31 points in a quarter. Two weeks ago Mitchell called the New Orleans quarterback “soft,” and Brees responded with vintage play against the Panthers that exposed Mitchell and the entire Carolina secondary. 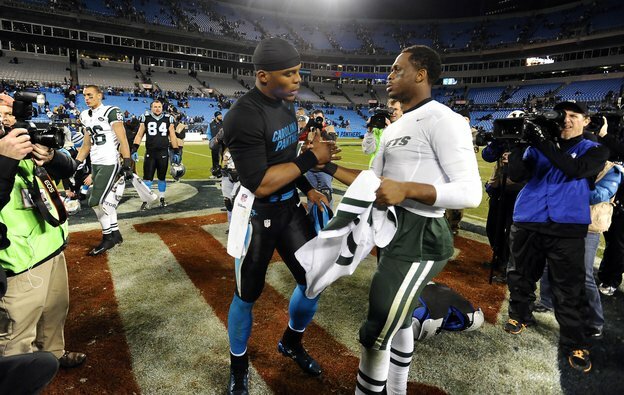 Next week the Panthers get the New York Jets at home. The Jets have won one road game all season, against Atlanta in early October. But for a bad team they’ve beaten good teams. They beat New England in October and they beat New Orleans in November. Is it the biggest game of the year? Coach Rivera says your next game is always the biggest of the year, so, yes…it is. Time to get well…time to work on the mistakes from the Saints game…time to change a few schemes to also prepare for the following week’s game against the Saints. CHARLOTTE – The Carolina Panthers didn’t have to sweat out a last-second win this time. Using a bruising defense to stifle any chances the Tampa Bay Buccaneers thought they had, the Panthers (9-3) won their franchise-record eighth game in a row, 27-6. Now, however, the next two-out-of-three games against the New Orleans Saints loom, and everyone is ready. Cam Newton, who sat out the last series, is ready. “It was great to be a part of this type of win,” Newton said. “But we all know that all roads are leading to New Orleans.” The Saints play tonight in Seattle in one of the biggest games of the season, and will host Carolina on Sunday night. The Panthers defense dominated the Bucs, sacking quarterback Mike Glennon five times and forced him into two turnovers. Just how dominating was the Panthers’ defense? How about holding the Bucs to just one third-down conversion in ten attempts. And the offensive line did a great job protecting Newton, not allowing a sack for the first time since November, 2012. The Bucs entered the game with 24 sacks in 11 games. Carolina Panthers quarterback Cam Newton (1) jokes around with receivers Brandon LaFell (11) and Ted Ginn, Jr. (19) on the sideline. After two very tight games, the Panthers came out and took care of business. Carolina had more than a 2-to-1 edge in total yardage, racking up 426 yards while holding Tampa Bay to 206. 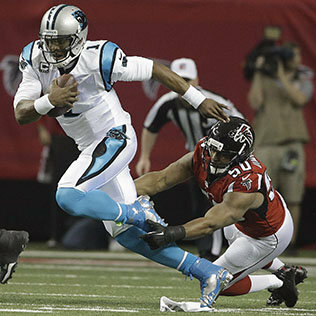 Newton was 18-of-23 for 263 yards, throwing two touchdowns and two interceptions. Additionally, he led the team in rushing with 68 yards on five carries. It was the third consecutive game Newton has led the team in rushing. Tight end Greg Olsen was his favorite target via the air, catching 5 passes for 85 yards. Ted Ginn, Jr. and Brandon LaFell caught a touchdown pass each. Carolina swept the season series with the Bucs by a combined score of 58-19. 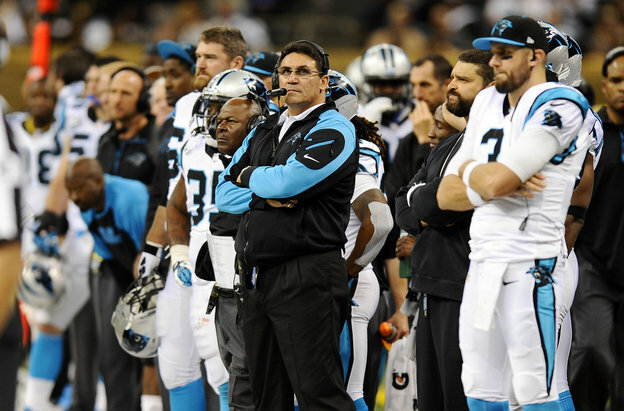 Once again, “Riverboat” Ron (Rivera) gambled on fourth-and-goal from the Tampa Bay 1 late in the first half. He got it on a Cam Newton dive in which Newton broke the plane of the goal line a half-second before fumbling. The Panthers never looked back. 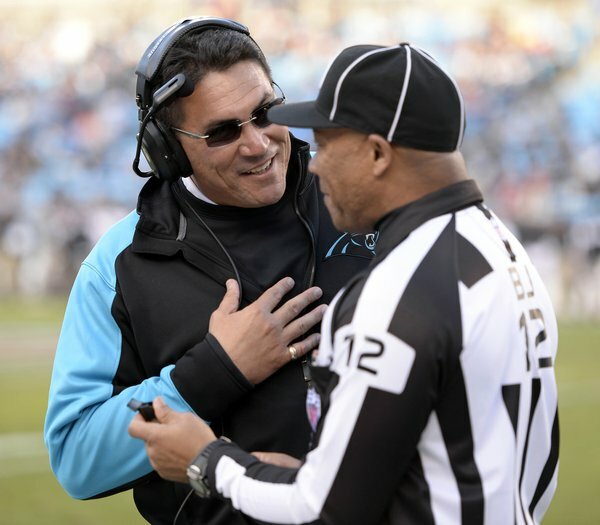 Carolina Panthers coach Ron Rivera jokes with an official during a timeout. Rivera called the win “cautiously efficient,” which was correct. The Panthers weren’t perfect, but they played well enough to never be in serious danger. In many ways, for Panthers fans used to sweating it out until deep in the fourth quarter, Sunday was a relief. The next three weeks are huge for the Panthers, who are defying the beginning-of-the-season odds. Very few people expected the Panthers to be 9-3 going into the two New Orleans games. And, should Seattle beat the Saints tonight, the Panthers and Saints would be tied for the NFC South lead. Can’t get much bigger than that! 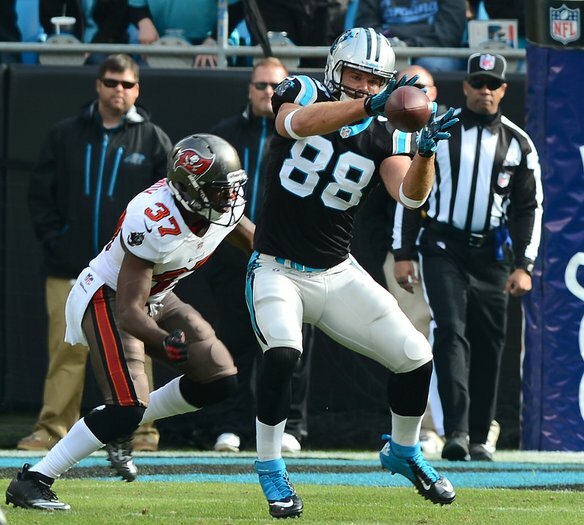 Carolina Panthers tight end Greg Olsen caught five passes Sunday. Tampa Bay running back Bobby Rainey: “When we don’t beat ourselves, we’re a great team. We didn’t do that today and the results showed.